In nutshell, converting the blueberry muffin you had for breakfast into fuel for your morning swim is the job of your body’s digestive system. Like finely tuned plumbing, the tubes and organs of the digestive system route food through the body, in the process breaking down nutrients into smaller particles that can be passed through the walls of the intestines into the bloodstream and carried throughout the body for use in metabolism. This system then flushes out material not needed for energy or cellular growth. 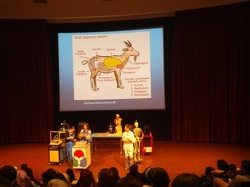 Therefore, in order to understand the intricacies of how the digestive system is able to do such miraculous things so efficiently and effectively without you knowing, you will have to go on a journey, a journey that is inexpensive and filled with a lot of fun: Cool labs/experiments and entertaining activities/games etc. c) the average meal takes between 15 hours and two days to pass through the entire alimentary canal.